Gypsy Scholar: Saudi Writer Zuhair Kutbi: "How do you expect the West to respect the Prophet"? 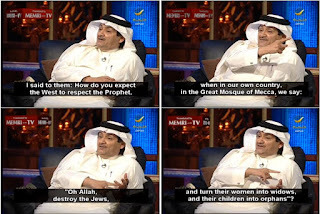 Saudi Writer Zuhair Kutbi: "How do you expect the West to respect the Prophet"? [The success of the King Abdulaziz Center's National Dialogue for reforming Saudi society from within was, f]rankly speaking, . . . about zero percent . . . . It was nothing but hot air, a waste of public funds, eating, drinking . . . I was there . . . . [Y]ou have to distinguish between National Dialogue as an institution and dialogue itself . . . . If only they had implemented even 10% of what was discussed in the 100 or so National Dialogue sessions. The National Dialogue institution has gained nothing positive for Saudi society. Give me one example . . . For instance, we all demanded to change the religious discourse. It has not changed, and it will not change either . . . . [T]hey turned off our microphones . . . mine . . . twice . . . . due to the content, not time. They cut me off. And when the session aired on TV, . . . my remarks had been omitted. There wasn't much freedom . . . . I was talking about the incident with the Prophet [cartoons] in Europe. I said to them: How do you expect the West to respect the Prophet, when in our own country, in the Great Mosque of Mecca, we say: "Oh Allah, destroy the Jews, and turn their women into widows, and their children into orphans"? Let me be frank . . . , although I know that I am being harsh: Most Saudi intellectuals are cowards. They are cowards and do not speak the truth . . . . The issue of the intellectuals is a very serious one. The struggle between the authorities and the intellectuals is an eternal one [everywhere], but in Saudi Arabia, it [has been] . . . completely contained. There is no such struggle. My beliefs have cost me my youth, my health, and my future. I have been forbidden to travel. I have been in prison six times . . . . I have been in the majority of Saudi prisons. They [even] put me in an insane asylum in Ta'if . . . . They said: This crazy man wrote a letter to the king demanding reforms. I was the first Saudi citizen to demand a constitutional monarchy. I wrote this to King Fahd in 1989-90. Let me tell you, regionalism and racism are part of Saudi Arabia's identity, and of the identity of Saudi people. Racism and regionalism are within us. We should not lie to ourselves and pretend that we are perfect angels. We are racist, racist, racist! I suspect one can find racism in every country, but what the Saudis suffer from is more than racism, it's Islamist supremacism, characterized by extreme intolerance and intense hatred of non-Muslims . . . on the part of a tiny minority of extremists, of course. He's got some cojones, it seems. I'm sure there's a fatwa somewhere that deals with cases of too much cojones.